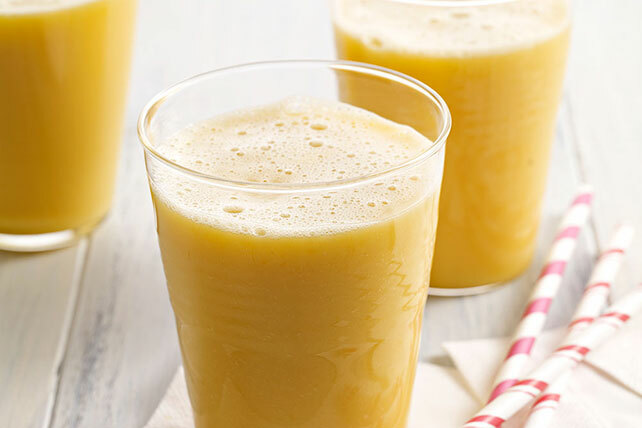 Harness mango, pineapple & orange flavors to make this Hawaiian-style pineapple smoothie. This Orange-Mango-Pineapple Smoothie is goodness in a glass. Prepare recipe as directed, using 100% cranberry juice and substituting frozen mixed berries for the chopped mangos. Prepare recipe as directed, using orange-strawberry-banana juice, and substituting 2 cups frozen unsweetened sliced strawberries and 1 sliced banana for the chopped mangos. Prepare recipe as directed; freeze until firm. Scoop into dessert dishes to serve.